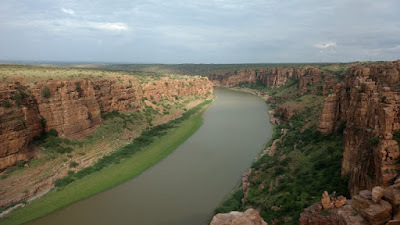 'Gandikota ?!?!?!!? What is that'. This was the first reaction my wife put across when I told her of a weekend trek I had booked. 'You know I will not be able to click Ganesh Chaturthi images in Mumbai because of your stupid idea'. My initial excitement turned into a small shrill of despair as I realized it was Ganesha chaturthi weekend that I had booked this trek for. 'Incoming religious stares' I thought. None the less, we both decided to go ahead with it. 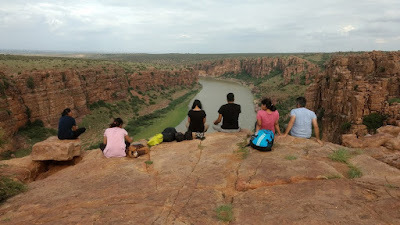 We booked our trek through a fantastic group called - Travel Trikon. Though the trek and journey is self manageable, the overall experience suggested by them was something which led us to book this trek. (PS: Please note I am not affiliated to Travel Trikon or any other travel groups and this is not a promotional post...though I would consider this an honor if this is considered as one). 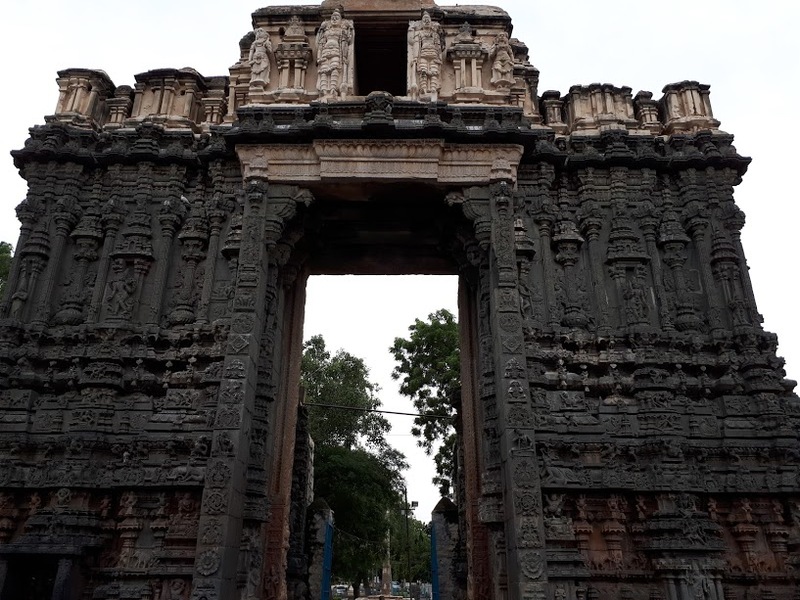 After enjoying a few great dosas outside the station, we took a shared Tata Ace for approx 1000 rs and commenced on an hour long journey towards Gandikota. The road from Muddanuru station to Gandikota is surprisingly good and free of any traffic. 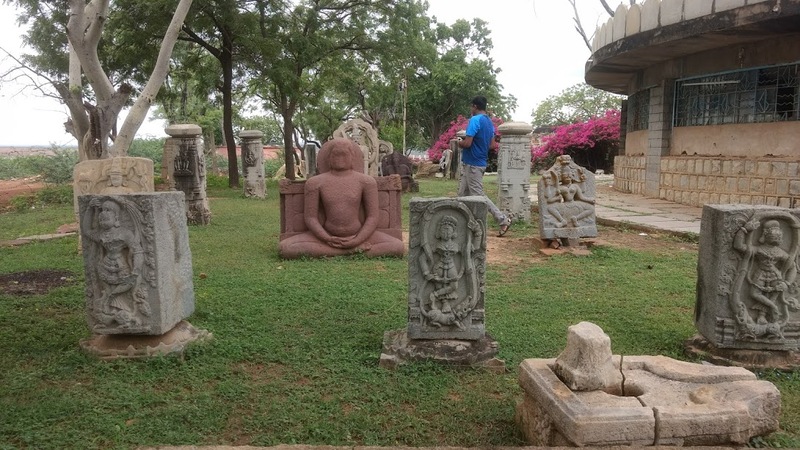 We managed to reach the Andhra tourism guest house in about an hour and half. 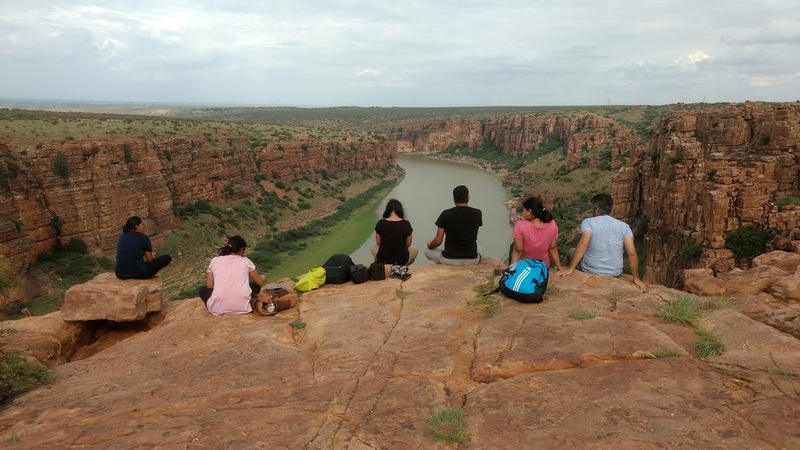 This is probably the best accommodation to take while visiting Gandikota and just ten minutes away from Gandikota fort and the gorge. It is also advisable to pre-book in advance as the cottages are limited. This is an easy trek. It is however advisable to carry a liter of water with you at all moments as the distance to be covered is considerable and its hot throughout the day in this part of the country. Also do carry sunscreen, caps, glares, etc as required. A five minute walk and you start to see the entrance of the once mighty fort. 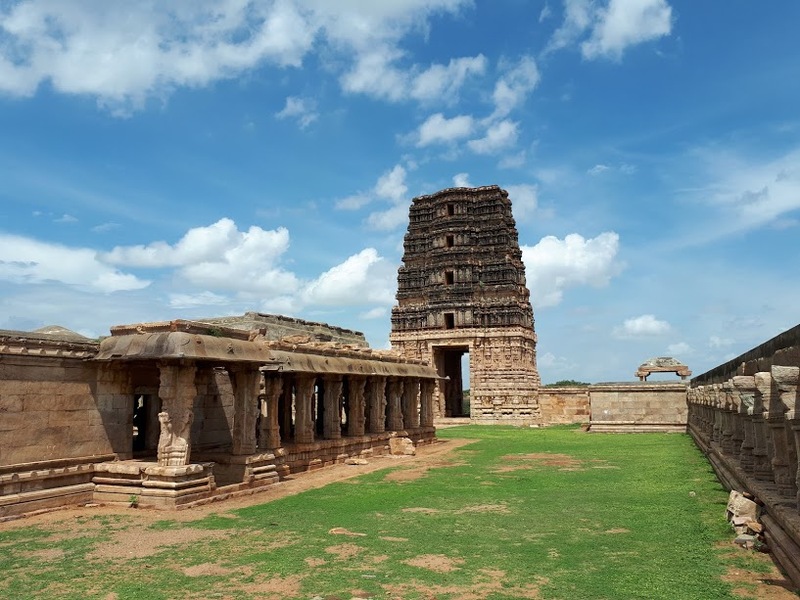 Gandikota was ruled by powerful Telugu dynasty, the Pemmasani Dynasty and was one of the most prominent forts in the country. 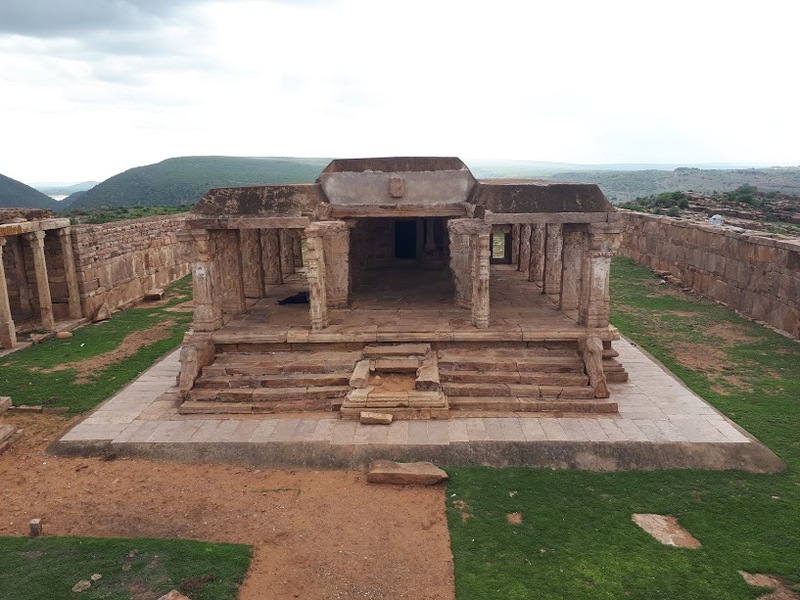 It was one of the greatest forts of south India in its heydays and so were the kings who ruled the region. 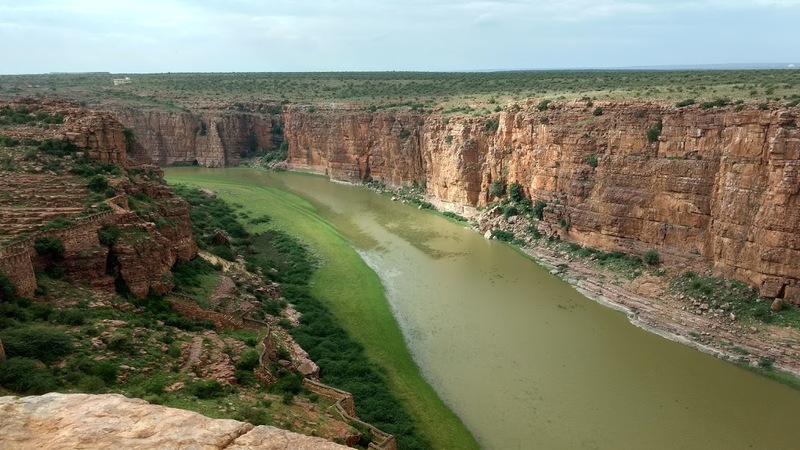 Years after its formation, Gandikota fort was ruled by the Mikkilineni Nayaks. Inside the fort are two ancient temples, dedicated to Madhava and Ranganatha. They are in ruins and the fort area is full of the debris of ages and many ancient structures in varying stages of decay. The large granary, with a vaulted roof, is now used as watchman's quarters. 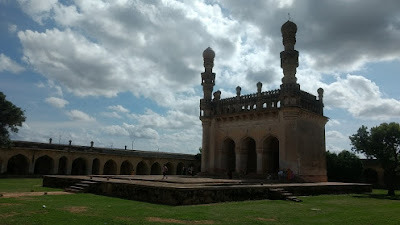 The Jamia Masjid has two adjacent minarets. 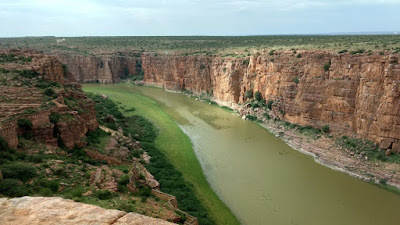 After a short flight of rocks at the other end of the fort you get the first sight of the Gandikota's Grand Canyon . Nothing..... I literally mean nothing can prepare you for the first sight of this amazing natural wonder !!!!! The gorge in all its glory leaves you spell bounded (to say the least). No image can do proper justice to the true glory of the place. We watched the sunset, played a few games and returned back to hotel late evening. After a nice hot water shower and rest, we headed towards the eating rooms for another round of great dinner. Discussed everything from the current state of tourism on India, Ancient Aliens, Nikolai Tesla and religion. There is also a small museum inside the hotel itself giving information on all the forts inside Andhra Pradesh. Time flew and before we knew it; it was 11 PM. Time for bed and dreams of exciting Day 2 which lay ahead of us. After commencing our journey at 9 AM, it took us approximately half an hour to reach the Mylavaram Dam. 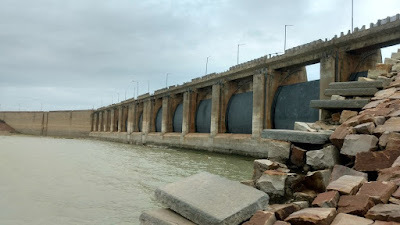 The exciting thing about the place is that vehicles are allowed to cross over the dam. The side walls of the road over the dam is broken at places and leaves your heart in mouth. The road is just enough to allow one vehicle to pass through and at places you can see the vertical drop right besides the end of vehicle tires. There is a museum nearby of all the excavations carried out in the region. 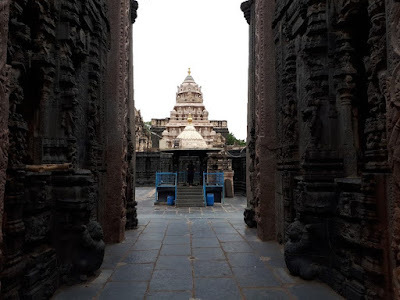 Its worth a half hour visit and gives you a brief insight at some of the amazing stone architectures from 16th century. From Mylavaram Dam it was an hour drive to the another natural wonder of the region - The Belum caves. The Belum Caves is the largest and longest cave system open to the public on the Indian subcontinent, known for its speleothems, such as stalactite and stalagmite formations. The Belum Caves have long passages, galleries, spacious caverns with fresh water and siphons. 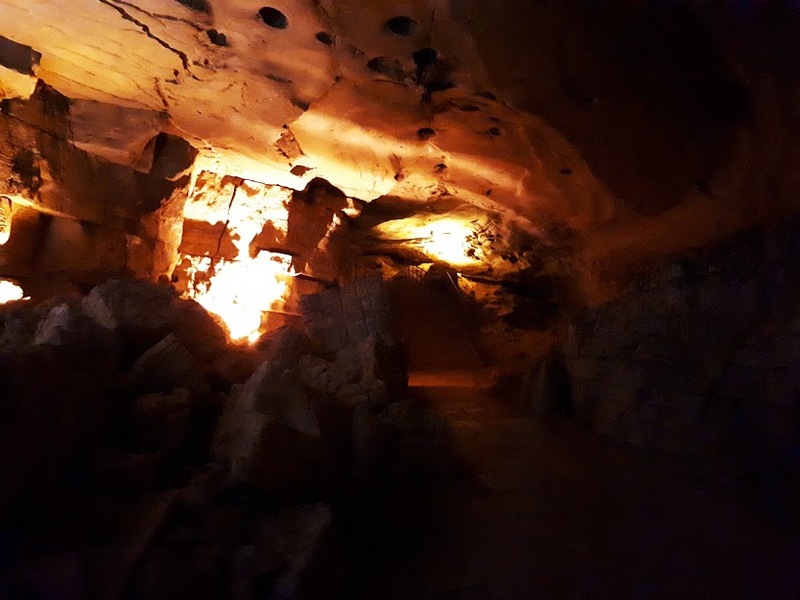 Belum Caves have a length of 3,229 m (10,593.8 ft), making them the second largest natural caves on the Indian Subcontinent after the Krem Liat Prah caves in Meghalaya. 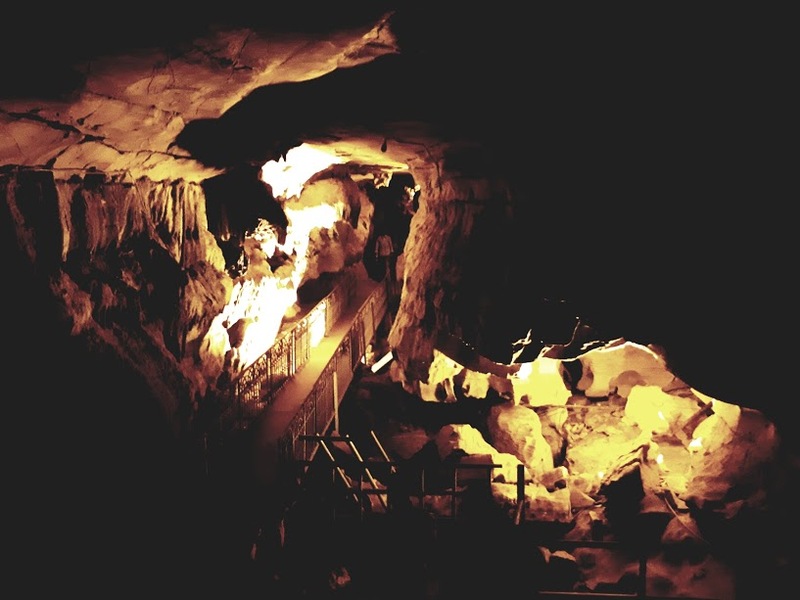 Belum came to scientific attention in 1884 by a British surveyor, Robert Bruce Foote and from 1982 to 1984, a team of German speleologists headed by H. Daniel Gebauer conducted a detailed exploration of the caves. Thereafter in 1988, the state government declared the site protected, and Andhra Pradesh Tourism Development Corporation (APTDC) developed the caves as a tourist attraction in February 2002. Today, 3.5 km (2.2 mi) of the caves have been successfully explored, though only 1.5 km (0.9 mi) is accessible to visitors. It is advisable to take a guide at entry point. The guides are well versed in Telgu language or have managable skills in English. But if you are expecting Hindi to be spoken in up-country Andhra, you will be in for disappointment. Entry is at 65 Rs. per person. Be sure to allocate at least an hour and half to the place as this is a geologist, adventure enthusiast and photographers delight !!!! For people who have breathing problems or issues against confined spaces need to cautiously move to the depths. Presence of large crowd on weekends may cause breathlessness. We finished off with our Indiana Jones styled adventure through the cave with our clothes drenched in sweat and proceeded towards the comfort of our AC vehicle. It was an hour and half drive to our next location and we thought of having lunch mid way. Abhineet, our expert guide throughout the entire trip took us to a local hotel which served us one huge bowl of delicious biryanis. Hungry like a wolf, we gobbled up the entire dish in a matter of minutes. The temple is a Siva shrine situated in Tadipatri , Anantapur District of Andhra Pradesh, India. It lies on the bank of the Penna river and is estimated to have been constructed between 1490 and 1509. We spent a quiet afternoon at the temple admiring the architectural genius of a bygone area. After an evening darshan (temple opens up at 5 PM evening) we headed towards the Tadipatri railway station situated 10 minutes away from the temple. The Mumbai Express arrived at 6.50 PM and we headed on our return journey towards Pune.